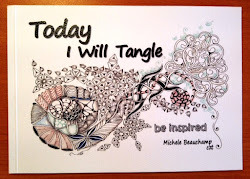 Shelly Beauch: Is it a Zentangle? 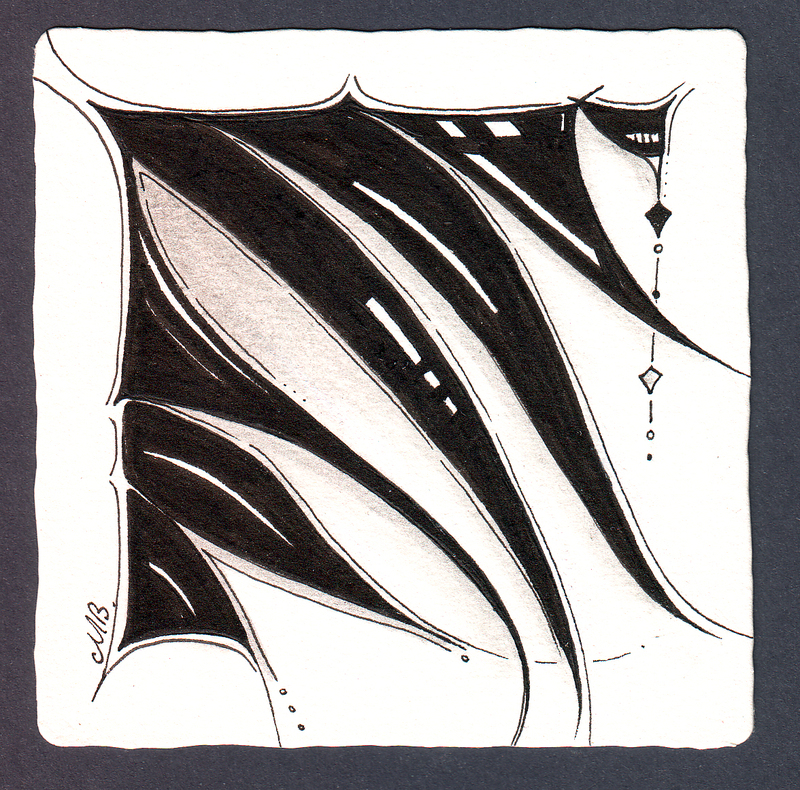 The Diva's Weekly Challenge #123: "Guest Post: Is it a Zentangle?" CZT Maria Vennekens has sent out a challenge to makes us think....... can you do a Zentangle without using existing patterns or tangeleations* of them? And what are your experiences while doing so? Just start.....corner dots, border, focus, then the ah-ha moment - a nifty string, fill in some spaces - officially black, add some auras, shade......jolly good! I am not sure if I'm on the right track but the basic Zentangle principle and repetition is there and not a tangle in sight. Is it a Zentangle? I relaxed, focused, and created = happy. Our son Joshua just walked in, he thought I had drawn black leeches! Wow, Beautiful. I just love it. I am too not very sure about the challenge but you nailed it. Great! 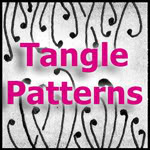 What a different zentangle and how beautiful it is! Thanks for the inspiration. Love the flow of it, very relaxing to look at. These look like curtains flowing in a summer breeze. Beeeautious! I think you did very well Michelle! I love the boldness of it. Wow. Love it. Definitely Zentangle, both in spirit and result. Well, whatever else it is or isn't, it IS beautiful! You got it! The essence of "no tangle." I never thought to do it this way but I love your end result. To me, your drawing reminds me of locks of black hair flowing in the breeze. Thanks for sharing. What an outstanding statement of beauty! Wow! Love the "simplicity" and such elegant lines. Awesome challenge and I think you are spot on with your take! Love it. Goes to show that simplicity is sometimes the best! It is very beautiful, it is free, fine lines and I like black and white areas, too. This is really super and I love the simplicity of the shiny lines. So simple, so beautiful. 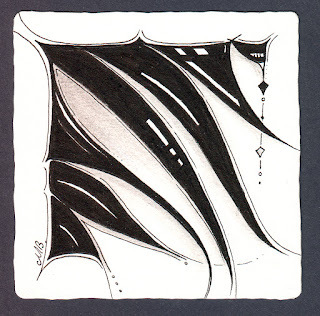 And yes I think it is a Zentangle, the right flow, the right thougts and last but not least you are happy, creating this. I don't know if it's a zentangle; but it is definitely a thing of beauty. I STILL get confused by the definition, as I mentioned in my blog. This was a tough challenge for me. Wow! I love your tile. Clear shapes and so lively! I love the flow of this tile and the white highlights on the "banners".